It's been something of a long time coming, this emboldened Bold. We got our first glimpse of the thing in February, spent some quality time with it back in June, and since then have sat around eagerly awaiting its release. Now, here it is. 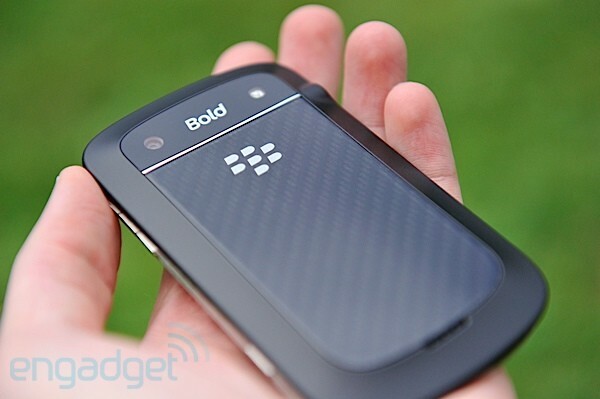 From a distance, or at a quick glance, it looks little changed from 2008's Bold 9000. But get closer, pick it up, and the difference is astonishing. RIM has gone to great pains to talk up this device's high-end design, its luxurious stylings, its sophisticated aesthetic. We're far from Vertu territory here, but the first time this phone hits your palm you know a lot of people spent a lot of time making it feel just right -- even if it still looks just the same. Of course, it's what's inside that counts, so join us as we find out whether the soft and hard bits beneath the surface can do the business too. While the old Bolds lived up to their name by being a little rounded, kind of chubby, a bit bulbous, the new model is rather more svelte and sophisticated. Looking purely at its face it's hard to detect that anything has changed. You still have the same portrait QWERTY layout with the same basic button scheme, but where once lived a trackball now an optical trackpad sits. That's flanked by a solid bar of backlit capacitive touch buttons, newly monochrome and flush with the display. A curving bit of chrome separates those buttons from the keyboard, as before. Pick the Bold up and turn it around a bit and the differences from previous models become apparent. The extent is now a classy rim of brushed stainless steel, one continuous band that we presume will offer some serious drop protection -- though we succeeded in not verifying that assumption in our time with this unit. That band is punctuated by ports, controls and buttons as needed. Up top is a single lock button, while the right side houses the phone's other controls. There's a volume rocker with a mute button nestled in the middle, and further down rests the Convenience Key, which by default activates the five megapixel camera. On the left side you'll find openings for a 3.5mm headphone jack and a micro-USB port, while on the bottom is a little, riveted inset that provides something of a minor visual distraction. Around the back you'll find another big change: an slab of composite weave has replaced the Leatherette on the old Bold, ditching tactility in favor of an extra bit of class. But, the soft-touch plastic that provides the tapered edge, covering the gap between woven panel and stainless rim, does feel a little bit cheap by comparison -- as a Mercedes CLS might look a bit low-rent next to a Bentley Continental. Overall, though, it's a solid, stately feeling phone that offers little visual presence but plenty of good feel. And, at 10.5mm (.41-inches) thick, it's rather svelte, too. The thing you'll want to touch first is, of course, the backlit keyboard, and we think you're going to like it. In fact, we'd go so far as to say this is among the best physical keyboards ever found on a phone, if not the best. It isn't substantially different than the old Bold, just a smidge wider but using the same design of curved keys that are tapered, each one subtly reaching up to meet your thumbs on either side. It's definitely intended for use as a two-thumb affair, working best when you're messaging with both hands, and when used thusly it'll easily keep up with your most torrid BBM exchanges. Around the back again, that hood-shaped wedge of carbon fiber-like material serves as the battery door, and an integrated conductive loop therein gives this thing the NFC chops its classmates the 9810 and 9850 lack. 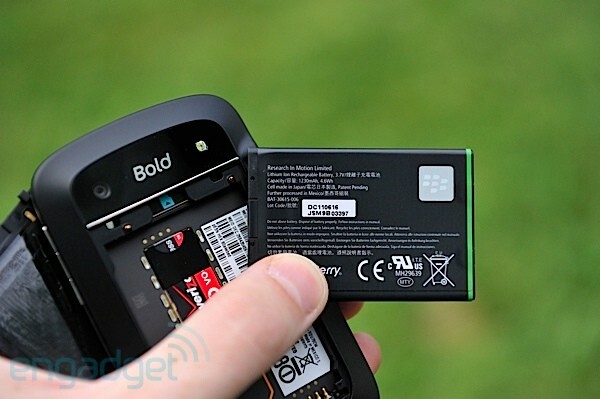 Lurking beneath here is a 1,230mAh battery, the same used on all three new handsets but a bit of a step down from the 1,550mAh unit found in the older, fatter Bold 9000. Tucked beneath that is a microSD slot, where you can add up to 32GB of storage to boost the 8GB that's built-in, and a SIM slot. You'll be needing that to keep every one of this phone's radios singing, and there are many in this chorus line. In addition to dual-band CDMA / EVDO (800/1,900MHz) you're looking at dual-band UTMS / HSPA (900/2,100MHz) and quad-band GSM / GPRS / EDGE (850/900/1,800/1,900MHz), plus 802/11a/b/g/n WiFi at 2.4 and 5.0GHz. If you've got a frequency calling, chances are this thing can answer -- unless it's 4G, of course. Move past the radios and things look less spectacular, as this is effectively a re-arranged version of the same hardware that's found in its sibling Torch handsets. From that perspective these are all basically the same phone, with a 1.2GHz processor, 768MB of RAM and so-called "Liquid Graphics" engine that promises to deliver smoother, more engaging performance. Did it? We'll see in the software section below. Finally, when it comes to call quality, the performance here is top-notch. While we find our handset to have average abilities when it came to seeking out and hanging on to the signal Verizon is putting out, calls always went through loud and clear. The speakerphone likewise will do quite well for your next impromptu concall -- even in the big conference room. You know, the one with the tired, faux-leather chairs and the automatic projector screen that probably knocked the socks off of potential clients back in the early '90s. 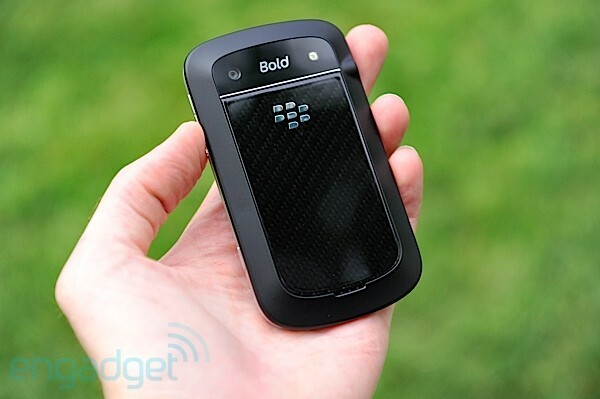 The new Bold offers a 2.8-inch LCD that may not be much bigger than that found in previous Bold models but is at least higher resolution: 640 x 480. It's hard to get too excited about stepping up to VGA in 2011, so forgive us if we're a little underwhelmed by the pixel count here, but resolution is more than adequate. In fact, its 287dpi rating is mighty close to the vaunted 300dpi supposedly needed to get us close to Retina territory. Coming from a big-screened slate of a phone you'll feel underwhelmed by the size here, but most BlackBerry users will appreciate the extra pixels. If indeed you can get past the size you'll agree this is a very, very nice display offering plenty of brightness for sunny days, beautiful color reproduction regardless of conditions and viewing angles good enough to offer almost full-contrast -- even when you can see only a sliver of the screen. It's quite a looker, just a shame it's so small. Where before the camera was situated smack in the middle, the 9900 series splits camera from flash, embedding the five megapixel sensor on the upper-right (when facing away from you) and the LED flash on the upper-left. When using the flash we found this created something of an unfortunate shadow on the right-edge of whatever we were imaging at close-range, but given this is an EDoF sensor you won't want to be that close anyway. In theory the camera has clear focus out to infinity, but the reality is EDoF makes macro shots impossible. In our sample gallery you'll see up-close shots of the flowers are blurred, and while your average executive won't be pulling this phone out of his trouser pocket to catch a passing daffodil in bloom, he probably will want to take close-up snaps of the business cards handed to him at last week's sales mixer. The 9900's camera isn't particularly well suited for the job. Take a step (or three) back, though, and you'll take adequate, though washed-out images. Colors are muted and balance is straying to the warm side, but the results are presentable even if they scream "this was taken on a cellphone." Video is captured at 720p and that fixed-focus means you won't have to worry about the lens hunting while filming. Stay a few steps away and things stay sharp, but we did notice a lot of jiggle distortion in the resulting footage, so you'll need a steadier hand than we could manage when filming the sample above. Do you hate change? 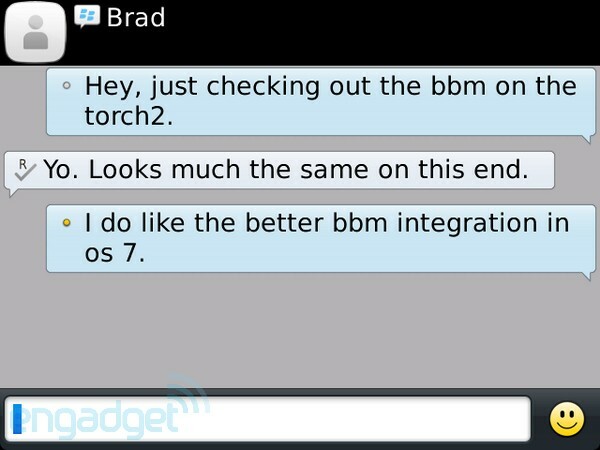 You are going to really love BlackBerry 7. The latest flavor of the OS got bumped from a minor to a major update for reasons that likely have more to do with marketing than hardware, but regardless of how you spin it this Bold is running what is, ultimately, a tweak to the BB6 that many of you know and have grown tired of. After playing with and (mostly) loving the gesture-heavy interface slapped over QNX to power the PlayBook we're naturally quite eager to see what's next for that little OS. Sadly, we're hearing we won't see anything like that on a phone until next year sometime. So, for now, we're left with an OS that feels every bit the latest, minor revision in a long, long history of minor revisions. 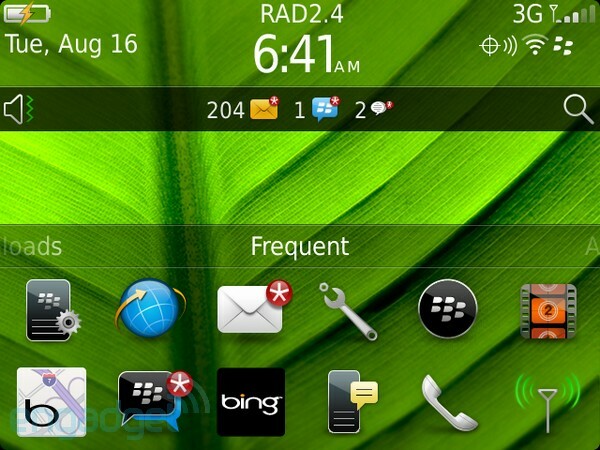 BlackBerry OS is showing its age in a not very good way. If you've been lately spending your time coddling something running Android, iOS, webOS or Windows Phone you're liable to feel like you stepped back in time a decade or so -- especially the first time you load up the browser, hit your favorite website, and get treated to a shockingly minimalistic WAP rendering. Gasp! Despite that simple default rendering this is an all-new browser with HTML5 support. It can handle just about anything the Web can throw at it -- except for Flash -- and do so with aplomb. Even complex pages render quickly and are smooth to navigate around. If you can manage to pinch on this tiny display you'll be able to zoom in and out, and there's plenty of elastic bounce should you scroll to any of a page's four extents. The OS's integrated search function lets you quickly hunt through contacts, favorites, e-mails, you name it. Now you can also search by voice, a feature that we found to be incredibly accurate at identifying whatever we mumbled into the microphone. The only drag here is that we had to accept not one, but two incredibly long license agreements before enabling that feature. In fact you'll be scrolling through pages and pages of legalese just about every time you try doing something new on your handset. That results in, needless to say, a somewhat unpleasant user experience. Finally, BB7 brings BlackBerry Balance to the mix, functionality that allows you to keep your work stuff from your home stuff. This can help you from losing your personal bits should an admin decide to remote-wipe your handset but, more importantly for the BES jockeys out there, it means users can be prevented from sending work information via personal challenges -- like, say, forwarding your company's internal Q2 projections out to everyone in your neighborhood investment club. In other words, it's a feature more intended for admins than those who are administered, and so nothing to get too excited about. Unless, of course, you're one of those admins. Ultimately, the OS is quick and easy to jump around in if you know what you're doing, and if you're looking for productivity you can find it here. 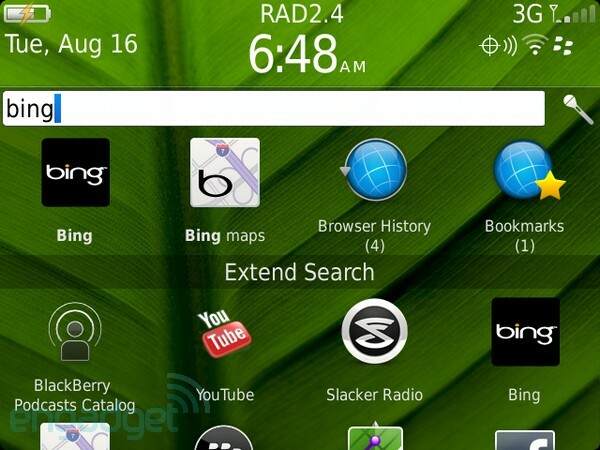 But, if you aren't, or you don't know your way around the world of BlackBerry, you'll find things ugly and unintuitive. There are too many lengthy, scrollable menus, too many hidden collections of options, and simply too little style to catch the eye of anybody who's been using a modern mobile operating system. If you're not sold on BB7, the application selection isn't liable to help matters. App World does offer a healthy choice, but the most entries are tiny little utilities with niche functionality that will leave you asking questions like "Do we really need an app dedicated to scanning Air Traffic Control at Ottawa International Airport?" In this case the answer is yes, someone does, but we can safely say that we could do without 3D Rollercoaster Rush Jurassic 2. This app is supposed to be the premiere title to show off the phones' new Open GL ES 2.0 support, and it sure does have polygons. It is also slightly less fun (and only slightly more interactive) than watching a video of someone else riding a rollercoaster. In addition to proving that, yes, these phones can render 3D games, this title helps to highlight an issue with all three: they offer only 189MB of total storage for apps. 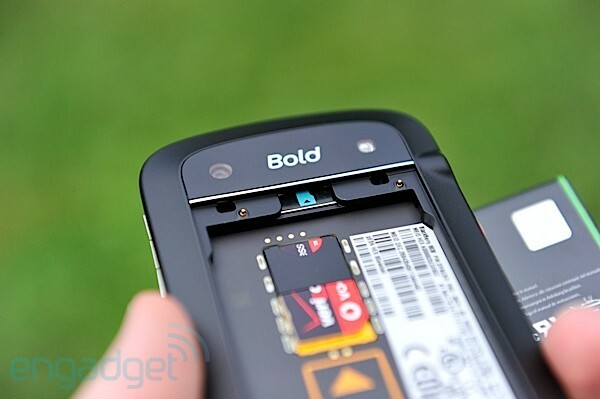 It doesn't matter that this Bold has 8GB of internal storage, and it also wouldn't help if you threw in a 32GB microSD card. You'll still have just 189MB of space for all your apps. To be fair, each app can take up no more than 7MB of this, and the vast majority of App World selections are very small indeed, but this has forced developers to make compromises. In the case of this game, you'll have to download the app, install it, then launch it and wait while another batch of data (17MB worth) gets downloaded to internal storage. Even if you're grandfathered in to an unlimited data plan this step can only be done over WiFi -- and in the end you have a pretty boring game. If you're looking for more fun, you'll find a full install of Documents to Go here, capable of creating and editing documents that fit the Word, Excel, and PowerPoint styles. We can't say how much of this 9930's speed is due to the new hardware within and how much instead is thanks to the revised software, but we can say that this is a very snappy, responsive phone. It pops open menus, launches apps quickly and, in general, keeps the hourglass on the shelf -- where it belongs. A cold boot (after a pulled battery) takes a rather painful one minute and 45 seconds, but after that you're looking at less than five seconds to bring the phone back to life after turning it off. More than acceptable. The BlackBerry Bold 9930 feels like the beginning of a transition -- the last hurrah for an OS that isn't much longer for this world. Or maybe that's just us being optimistic. 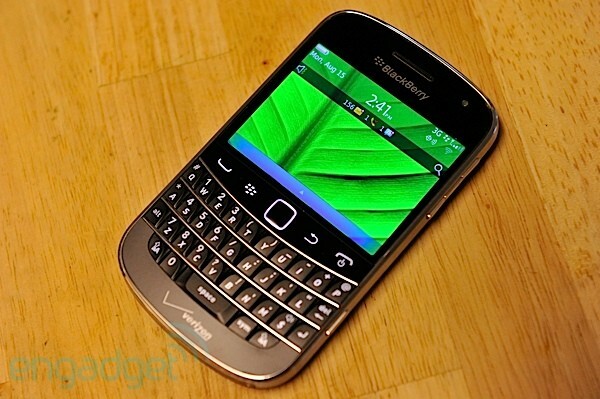 We'd love to have been able to use this phone with a more modern, more refined feeling OS, but as it is we have some great hardware running software that just won't appeal to anyone who has already left (or was never pulled in to) the BBM fold. And maybe, for now, that's the best RIM can do -- stem the tide. The company isn't exactly losing its customers, it just isn't growing as quickly as the competition, and until it has a truly mainstreamable operating system it never will. 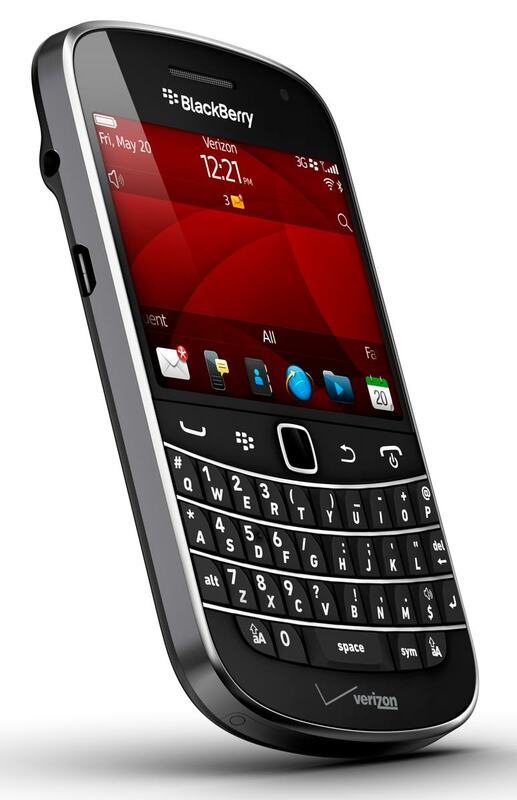 So, don't look at the 9930 as a phone that'll end what ails RIM and introduce it into new markets. Look at it as the best damn embodiment of what BlackBerry is today -- and then join us all in crossing our fingers as we wait for the next release of BlackBerry OS, which hopefully will bring something truly different to the table.